A pioneer in the concept of online cash-back shopping has grown into a major consumer e-commerce platform. Email is an essential driver of revenue for the business, and the timing and content of offers are determined by real-time changes in user behavior and business metrics. 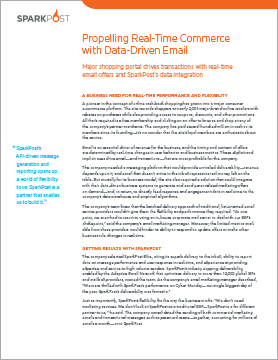 The company needed a messaging platform that would provide unrivaled deliverability. But crucially for its business model, the site also required a solution that could integrate with their data-driven business systems to generate and send personalized marketing offers on demand—and, in return, to feed response and engagement data in real-time to the company’s data warehouse.